Born to a wealthy, noble family, the third of six children, son of Count Giberto II Borromeo and Margherita de' Medici. Nephew of Pope Pius IV. Suffered with a speech impediment. Studied in Milan, and at the University of Pavia, studying at one point under the future Pope Gregory XIII. Civil and canon lawyer at age 21. Cleric at Milan, taking the habit on 13 October 1547. Abbot commendatario of San Felino e San Graziano abbey in Arona, Italy, on 20 November 1547. Abbot commendatario of San Silano di Romagnano abbey on 10 May 1558. Prior commendatario of San Maria di Calvenzano abbey on 8 December 1558. Protonotary apostolic participantium and referendary of the papal court to Pope Pius IV on 13 January 1560. Member of the counsulta for the administration of the Papal States on 22 January 1560. Appointed abbot commendatario of Nonatola, San Gallo di Moggio, Serravalle della Follina, San Stefano del Corno, an abbey in Portugal, and an abbey in Flanders, Belgium on 27 January 1560. Created cardinal on 31 January 1560 at age 22. Apostolic administrator of Milan, Italy on 8 February 1560. Papal legate to Bologna and Romandiola for two years beginning on 26 April 1560. Deacon on 21 December 1560. Vatican Secretary of State. Governor of Civita Castellana,Italy in 1561. Governor of Ancona on 1 June 1561. Made an honorary citizen of Rome, Italy on 1 July 1561. Founded the Accademia Vaticana in 1562. Governor of Spoleto, Italy on 1 December 1562. Ordained on 4 September 1563. Helped re-open the Council of Trent, and participated in its sessions during 1562 and 1563. Named prince of Orta in 1563. Member of the Congregation of the Holy Office. Bishop of Milan on 7 December 1563. President of the commission of theologians charged by the pope to elaborate the Catechismus Romanus. Worked on the revision of the Missal and Breviary. Member of a commission to reform church music. Archbishop of Milan on 12 May 1564. Governor of Terracina, Italy on 3 June 1564. Archpriest of the patriarchal Liberian basilica in Rome in October 1564. Count of the Palatine in 1564. Prefect of the Tridentine Council from 1564 until September 1565. Papal legate in Bologna, Romandiola, legate a latere, and vicar general in spiritualibus of all Italy on 17 August 1565. Grand penitentiary on 7 November 1565. Participated in the conclave of cardinals in 1565 to 1566 that chose Pope Pius V; he asked the new pope to take the name. Protector of the Swiss Catholic cantons; he visited them all several times worked for the spiritual reform of both clergy and laymen. Due to his enforcement of strict ecclesiastical discipline, some disgruntled monks in the Order of the Humiliati hired a lay brother to murder him on the evening of 26 October 1569; he was shot at, but was not hit. Participated in the conclave in 1572 that chose Pope Gregory XIII. Member of the Apostolic Penitentiary in May 1572. Worked with the sick, and helped bury the dead during the plague outbreak in Milan in 1576. Established the Oblates of Saint Ambrose on 26 April 1578. Teacher, confessor and parish priest to Saint Aloysius Gonzaga, giving him his first communion on 22 July 1580. To help the Swiss Catholics he founded the Collegium Helveticum. 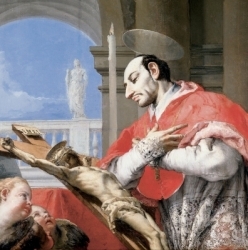 Saint Charles spent his life and fortune in the service of the people of his diocese. He directed and fervently enforced the decrees of the Council of Trent, fought tirelessly for peace in the wake of the storm caused by Martin Luther, founded schools for the poor, seminaries for clerics, hospitals for the sick, conducted synods, instituted children's Sunday school, did great public and private penance, and worked among the sick and dying, leading his people by example. Son of Count Raoul de Vermandois et de Valois and Alienor de Champagne. As a child, Felix received the blessings of Saint Bernard of Clairvaux and Pope Innocent II. Educated at the abbey of Clairvaux. As a young man, following his parents' extremely disruptive divorce, he renounced his wealth and took the name Felix. Cistercian monk at Clairvaux. Hermit in the Italian Alps. Priest. Hermit in the forest of Galeresse, diocese of Meaux, France. 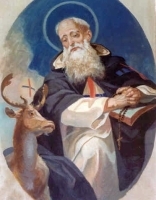 Friend and spiritual teacher of Saint John of Matha. The two of the founded the Order of the Holy Trinity for the Redemption of Captives (Trinitarians; Redemptionists) in order to ransom Christians held as slaves by Moors in Spain and Northern Africa. The Order received papal approval on 17 December 1198, and within 40 years there were over 600 houses worldwide. Today there are around 600 members of the Order working in prison ministries in over twenty countries continuing over 800 years of ministry. Daughter of Louis d'Amboise, Viscount de Thouars, she grew up in the courts of Brittany. Duchess of Brittany, being married to Peter II, Duke of Britanny at age 15; she was betrothed to him at age four. It was not a happy marriage, and Peter sometimes abused her, but Frances softened Peter over the years, and he assisted in her charitable work. She established a Poor Clare convent at Nantes, France, and worked for the canonization of Saint Vincent Ferrer. Supported the Dominican convent at Nantes. Widowed in 1457, she devoted herself to religious life. Joined the Carmelite nuns at Bondon on 25 March 1468, making her final vows in 1469. Spiritual student of Blessed John Soreth. Worked in the infirmary for a while, and was elected prioress for life in 1473. 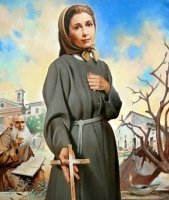 Considered the foundress of the Carmelite nuns in France. Priest. Leader of a group of twelve 6th century Syrian monks who evangelized Georgia, and introduced the monastic life to the region. Said to have befriended the bears that lived near his hermitage, and to have found them friendlier than most of the natives! His companions were Abibos Nekreseli, Anton Martmkofeli, David Garejeli, Zenon Ikaltoeli, Tadeoz of Stephantsminda, Ise of Tsilkani, Ioseb of Alaverdi, Isidore of Samtavno, Miqael of Ulompo, Piros of Breta, Stephane of Khirsa, and Shio of Mgvime, and the group was known as the Fathers of the Church in the region. A first century Christian in Rome greeted by name by Saint Paul the Apostle in the Epistle to the Romans. Born a prince, the son of Saint Stephen of Hungary. Spiritual student of Saint Gerard Sagredo. Married in 1022. Known for his personal piety and austerity. Spiritual student of Saint Grimbald. Benedictine monk. Bishop of Winchester, England from 931 to 934. Known for his work with the poor, and his mission of praying for the dead; at one point the dead are reported to have responded "Amen". Founded the Hospital of Saint John in Winchester, which still exists today. 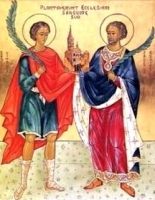 Memory of him was lost for years until he appeared with Saint Birinus and Saint Swithun in a vision to Saint Ethelwold who spread the word that Birstan was in heavenly glory. Became a Poor Clare nun at age 12, receiving the veil from Saint Francis of Assisi himself at Arcella. Had the gift of inedia, living solely off the Eucharist for months. Her health suffered in adulthood, and she was both blind and mute by her death. During the persecutions of Diocletian, Agricola witnessed the martyrdom of Saint Vitalis of Bologna; the courage of Vitalis led Agricola to stand up for his own faith. Martyr. Joined the Hospitallers of Saint John of God at age 14. Belonged to the community in Ciempozuelos, Madrid, Spain. Martyred in the Spanish Civil War. Son of Count Ostierne. Bishop of Tongres, Belgium in 598. Benedictine Basilian monk at Cerchiara, Calabria, Italy. Fled to Rome, Italy to escape invading Saracens. There he met and befriended Emperor Otto III who invited him to Germany and built for him a Benedictine abbey at Burtscheid near Aachen. Martyred in the persecutions of Diocletian. His death led Saint Agricola to stand up for his faith, which led his martyrdom. The basilica in Ravenna, Italy is dedicated to Saint Vitalis. Born to the English nobility. Priest. Hermit near Rouen, France. Martyr. The village where he was murdered is named for him. Priest. Wrote a number of treatises on philosophy and theology. Director of the Catechetical School of Alexandria, Egypt. Noted preacher and teacher and scholar praised by Eusebius of Caesarea and Saint Jerome. Bishop of Rodez, France, an area that had begun to fall away from Christianity. His evangelism brought his parishioners back to the faith. Niece of Saint Modoald of Trier. Benedictine. First abbess of the convent of Oehren, Trier, Germany, appointed by Saint Modoald. Hermit on the banks of the river Never, then in the Inny valley in North Cornwall, England in an area now named for him. Benedictine monk at Zwiefalten, Swabia (in modern Germany). Prior of Ochsenhausen, Swabia. Benedictine monk at Saint Aubin Monastery, Angers, France. Priest.